Our new neighbours recently removed a tall conifer hedge which shaded a corner of our garden for about half the day. First thing in the morning it is shaded by a tall birch tree in our hedge. I hadn’t done much planning for this corner, it is next to the compost bins, used to have our bonfire until I stopped burning garden waste, and contained an old elderberry tree, bamboo boundary, loganberries, a young hazel and a young rowan. The elderberry was beginning to rot through in places, the bamboo was beginning to be invasive, the hazel and rowan weren’t planned and the loganberries were planted in a very poor soil which was mostly a mix of cinder and dusty soil that we had dumped there when we first acquired this part of the garden. Since I don’t burn garden waste any more I had to find a way of disposing of the elder. As the soil is desperately in need of improvement and I have had some success with HugelKultur beds so far I thought I might as well bury it. I started to dig and found more and more stone. As I needed a path, originally planned to be of grass, I dug out the soil, put some left over timbers from next door’s skip to edge the path, put in a membrane and filled the path with the stone. I already had several piles of this stone around the garden waiting to do something so this was an excellent way of re-using it. The elder went nicely into the hole I dug for the bed, I added some other garden waste, covered it over and planted spelt in rows along the length of the bed. I had to replant the top of the bed a week or so later as the local foxes / cats had disturbed the top of the bed. 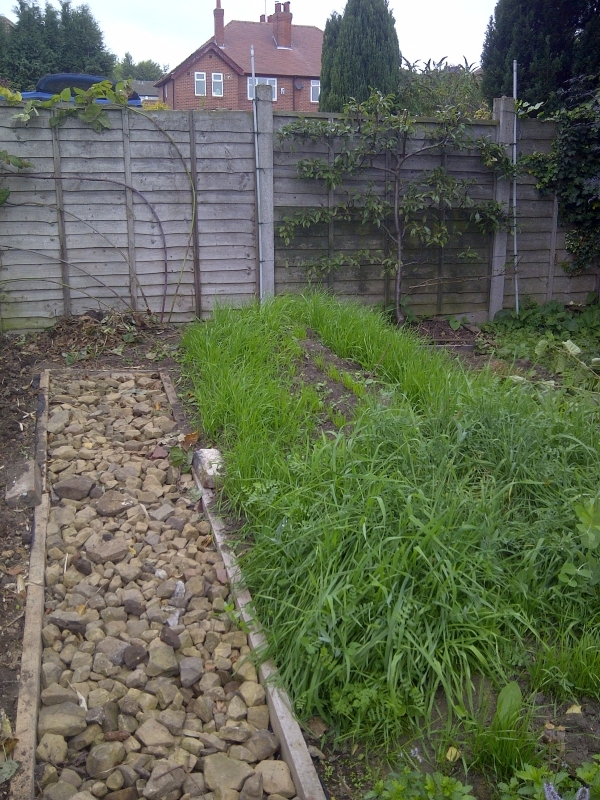 The nearest part of the bed in the photo has some green manure on it. This is now known as the Elder HugelKultur bed – where I have buried my elder! Against the fence you can see my attempt at an espaliered pear that I planted many years ago. Unfortunately I think it may be in the wrong place now as other trees have grown up and shade it in the morning. Hopefully it will benefit from the additional light later in the day now that the conifer hedge has gone. This year it has produced only one pear! To the left of the pear I have removed one of the loganberries to replant on one of my other projects. The remaining plant is now trained along the fence and round the corner and I have added some compost to improve the soil. Now to plan what goes in on the left of the path next to the compost bins!